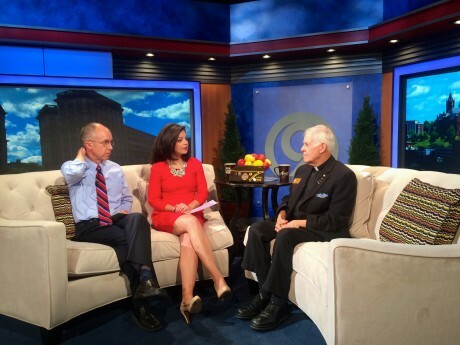 Father Moritz Fuchs, retired Catholic priest and native of Fulton, was interviewed on WSYR Channel 9’s “Bridge Street” show on Veterans’ Day to share his experiences as a Army veteran of World War II and his role as the sole bodyguard for Robert H. Jackson, chief prosecutor at the Nuremberg trials and U.S. Associate Supreme Court Justice. The trials, in Nuremberg, Germany, were a series of military tribunals held by allied forces after World War II for the prosecution of prominent members of the military, political, and economic leadership of Nazi Germany. Father Fuchs, above, shares his story with Bridge Street hosts Sistina Giordano and Jim Teske. The interview can be seen at www.localsyr.com in the Bridge Street video section.